Personally, I don't agree with or appreciate Christian evangelistic efforts that use entertainment, theatrics, emotionalism, or calculated salesmanship schemes to draw people into the Kingdom of God. I'm not opposed to hellfire preaching (which is often associated with old-time evangelism) because, sad to say, hell is a reality that every person who rejects Jesus Christ will face. The Gospel message of salvation is, after all, about being saved from God's just punishment for sin, and that punishment is hell. I actually believe the world could use more preaching on hell (and how to not end up there), but not with the theatrics, please. I think that serious preaching, or personal reading, from God's Word (a.k.a, the Bible) is a far better way for sinners to learn about the good news of the Gospel. This is, in fact, what the Bible itself says (Romans 10:14). All of which leads me to Billy Sunday (1862-1935). He was a legend in his own time—first, as a talented baseball player, then as a traveling evangelist. 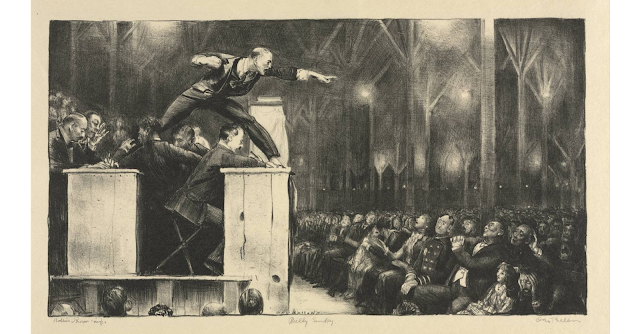 Billy Sunday drew enormous crowds. He was a sensation. He was a celebrity. He was the archetype caricature for all fast talking show-evangelists. 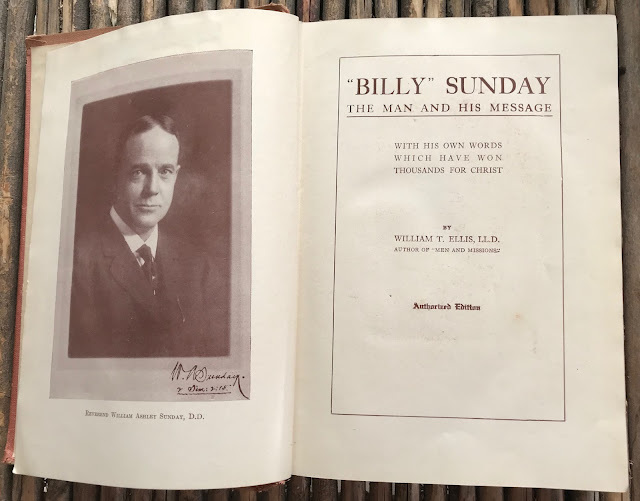 Billy Sunday is on my mind lately because I recently bought a copy of Billy Sunday:The Man And His Message at a thrift store ($1.50). Copyright 1914, the book claims it is "Authorized by Mr. Sunday." 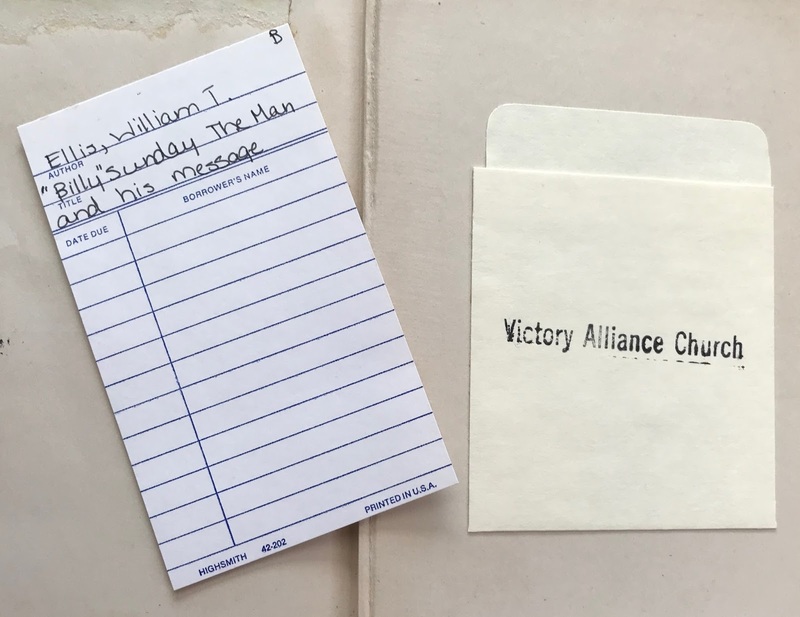 As the picture below seems to indicate, no one at Victory Alliance Church cared to learn anything about Billy Sunday. But I think that is kind of typical. There is barely anyone alive today who ever heard Billy Sunday in person. And we all have a natural tendency to be historically parochial. The joke goes that most modern Christians think Christianity started with Billy Graham in the early 1950s. So it is that precious few Christians today care to read old Christian books. Take, for example, Puritan writings. Puritans? Who are they? Didn't they live 400 years ago! What could we possibly learn from them? Yes, that's the modern mind at work. But I digress. Knowing something of the caricature of Billy Sunday, I admit to being skeptical of the man. But I am, by nature, drawn to the cultural and historical aspects of his story. So the old book captured my attention. It is an instructive book, and not disappointing in that regard. 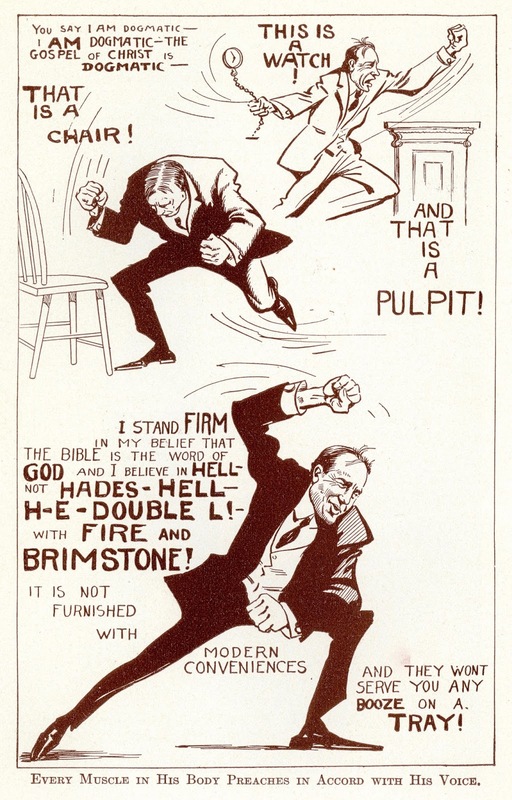 Although, biblically speaking, I consider it to be theologically shallow, I do think Billy Sunday was a sincere Christian (as opposed to a charlatan). He had a talent for getting people's attention and encouraging them to rethink the meaning and direction of their lives. That's a good thing. But his approach just doesn't set well with me. Perhaps it was best suited to the times he lived in. In any event, the old book is full of clever witticisms, quips and aphorisms from Mr. Sunday. I think many of them are worth unearthing and bringing into the light of this new century—kind of like an archaeological dig. That being the case, in an upcoming blog post I will share a few selections. Just recently, I heard a message where the speaker was talking about B.Sunday. He raised some interesting questions and read some interesting historical facts. For example, He asked, Why B.Sunday was supported by f-masons, what was that in his message or "christianity" that was not intimidating for them, but rather they liked and supported his christianity. The speaker gave some answers, but I wasn't satisfied fully with those answers. One of C.S. Lewis' many penetrating comments was that modern Christianity and in fact the modern worlds tends to eschew the old books - which, he pointed out, was greatly to their lost. I'd like to think that library card from Victory Alliance Church was the third or fourth one for that book. I didn't know much about Billy Sunday other than his contribution towards prohibition. Sounds like a lively preacher that would have held one's attention! Looking forward to more on this topic.